Striper and shad are a go on the American right now. Flows are still high and wading can be difficult but those fishing out of a drift or jet boat are having good success. For striper stripping flies on sinking lines is the name of the game. Traditionally good flies for this time of year will be Byng’s Bait fish in white/chartreuse, Toby’s American River Rainbow Clouser and the Stay Hungry Streamer in gray/white. Shad are being caught in the usual spots. They will take flies that are swung or nymphed so there are options for how to get them. Stop by the shop for the complete list of striper and shad patterns that are currently getting it done. Delta Stiper – Poor Water Temp high 64 to 67 degrees. Water Clarity – Clear in some areas, murky in others. Fishing has gotten more difficult in the last 1-2 weeks for striper. We’ve been scratching some days of 5 to 10 fish with few quality fish in the 2 - 10lb range. Things are definitely on the decline when it comes to striper as they are moving up into the Sacramento, American etc. Good news is that with warmer temperatures the largemouth and smallmouth bass will start looking up & we should see some great topwater in the coming weeks. We are finding some largemouth already both on top and sub surface especially on hot calm days. Try throwing a clouser minnow variation or bluegill patterns on sinking lines. 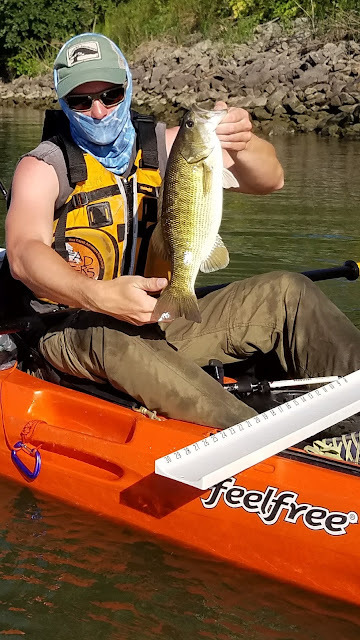 We have had some fun chasing bass in the back bays in Kayaks the last few weeks. If you are in for a fun adventure let us know and we can set something up. Captain Bill Beckett says a "size 10 Foxee red Clouser has produced most fish". Guide Tip: "Fish have been taking top water flies mid day in the shade". 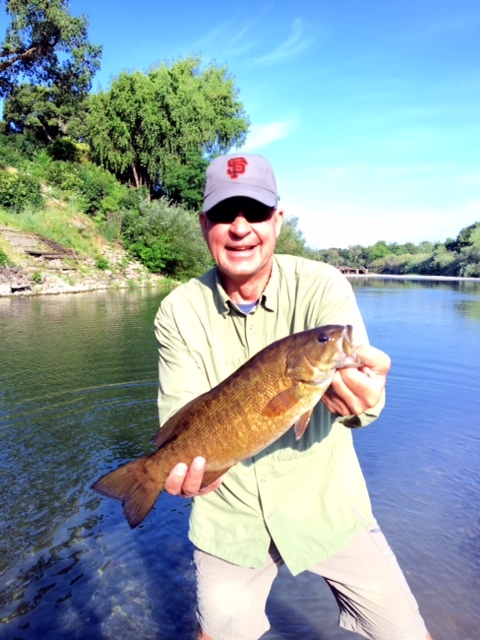 Additionally we will be looking forward to chasing smallmouth on the Delta soon. Water clarity and colder temps are still keeping things so-so for now but this won't last long. If you like fast action and surface grabs on poppers at point blank range than this could be just the ticket for you. We love getting our guests out chasing these bronze beauties on top water where 20 to 50+ fish is not uncommon even on half day trips. This is an ideal fishery for young anglers and lasts throughout the summer. Captains Bryce, Maury, Toby and Chuck have this thing dialed. Give us a ring to reserve an SMB trip for you and yours! With all the rain this winter the Fall River is very full and looks to be in great shape. Our yearly Specialties trip a few weeks back saw fishing that was so so. Big fish was a 23" bow but there weren't as many fish caught as we normally experience. Some sporatic hatches of mayflies including PMD’s and Blue Wing Olives warming up. Reports of some quality fish being caught this week by our guests, but just not the numbers that were used to. 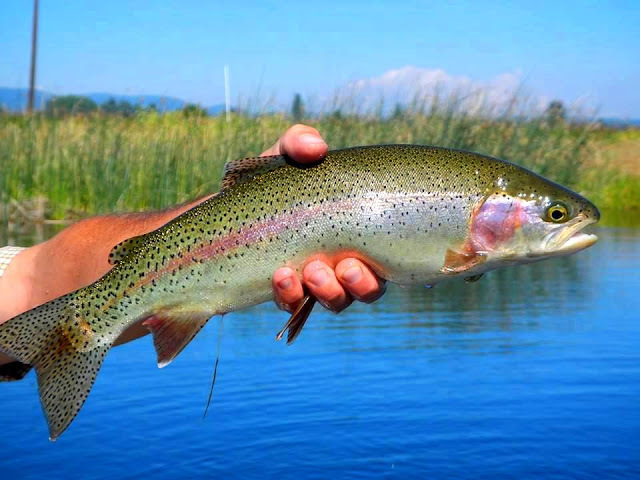 Feather River Trout – Poor Flows – Too high but dropping! We have not had much luck with the flows being so high recently on the Feather. We hope to have a better report soon but with all the rain and damage to Oroville Dam it may take months or even years to fully recover. Fishing has been great so many other places that we haven't spent much time here recently. Time will tell but we need the flows to come down to give it a real go. Stay tuned or call (707)287-2939 or (916)722-1055 for updates. Hat Creek looks better than it has in years with all the water. It is about a foot higher than it is normally this time of year and warm weather is bringing extra water from Mt. Lassen’s North East Slope. Hat 2 powerhouse has been busy but once you get away from that you can have the river pretty much to yourself. The recent habitat restoration and riparian work looks great and there is a new bridge below Power House #2 riffle to access both sides of the river off of Hat #2 Road. Anglers have been seeing some decent bug activity including, PMD’s, Little Yellow Stones, a few caddis, some larger Stoneflies and even some winged ants hatching this last few weeks. Look for rising fish or fish and attractor dry and see what pops up. Try fishing early and late but some nice fish caught mid day on dries again this week. 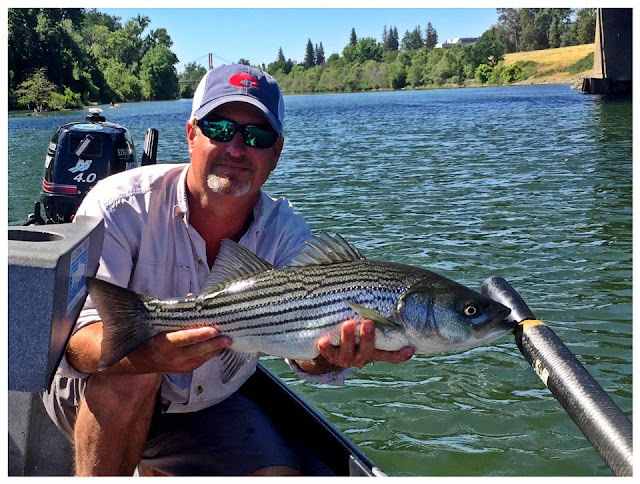 This time of year the Napa River is mostly about schoolie striper. This can be a lot of fun on a 6 or 7 wt but don't expect a ton of monsters right now. Good numbers of fish out balances out that most fish are small. Any small clouser style flies in olive/white, gray/white size 1/0 or 2/0 will work. Our favorite is the Stay Hungrys in above color/size. Stay tuned for updated reports, or give us a call at (707)287-2939 or (916)722-1055 for current information. Flows on the Pit are fluctuating throughout the day which is common this time of year. Use extreme caution if you go. Flows are still almost too high to wade. We recommend Pit 3 if you simply must go. Best flies are PT's, Stones, Red Copper Johns, Zebra Midges, Psudo and Micro Mays, Poopas and E. Caddis. Again fishing will improve as water levels drop and become more manageable for fish and fisher alike. Also watch for Rattlesnakes. Putah has improved recently with some nice fish being caught like this one. Water is steady at 465 cfs and fishing is prime. BWO's, midges, Caddis and SJWs have been working. Get those fies down quickly for best results and wade careful. There are currently smallmouth bass and shad taking flies on the Russian. Temps vary from 64 to 70 degrees throughout the day. Bass are just now starting to become active. Clousers are starting to work but a crayfish or leach fished slowly along the bottom will get bit. Shad fishing is hit or miss in the lower river around Guernville and Monte Rio. Being in the right spot is key and if so 5 to 10 fish can come in rapid succession. A dozen fish on the fly is a great day on the Russian. Rob Russell says "shad patterns have become smaller and more subtle in recent years but any size 8 to 10 shad fly should work." We recommend a 6 weight rod with a shooting head combo. Shad will take flies swung down and across the current so even a small switch rod can prove to be effective. If you are in Napa or Sonoma wine country and want to get out for some summer fun give us a ring. Flows on the Lower Sac are high and steady at 13,000 cfs. Clarity is improving as the river has been the color of green tea with a splash of cream. Fishing continues to be great with good numbers of fish in the net for our guests even with warmer temps and milky conditions. The thermometer recently broke tripple digits but the fish don'w care! Hatches right now consisting of PMD's BWOs, Caddis and Sallies. 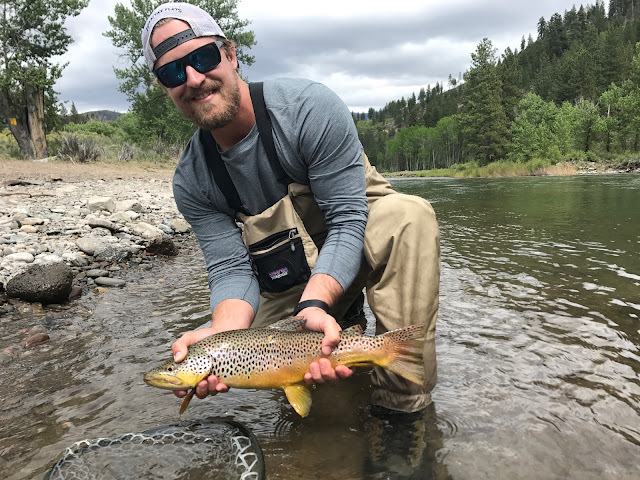 Shane Kohlbeck says "Rubber legs and caddis pupae working well "... and "hatches will improve with warmer temps and cleaner water." Water is high on the Upper Sac as well making for tough wading. Hot weather will call for wet wading to cool off. We also recommend a wading staff and a CO2 inflatable hip pack or suspenders may not be a bad idea either. Best fishing has been above Dunsmuir. Salmon flies and Golden stones have been flying around. Best flies have been small nymphs fished behind a rubberleg stone. Princes, Dark Lords, Copper Johns, Birds Nests, Fox’s Poopahs, Mercers’ Micro Mays etc. Fishing will improve as the water drops and this will be a good place to escape the Valley heat. Give us a call to set up some good summer fishing. 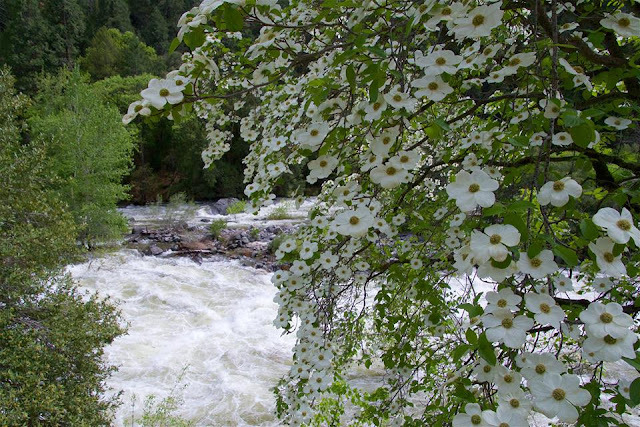 McCloud River – Good Flows 350 cfs+. Water clarity - clearing. 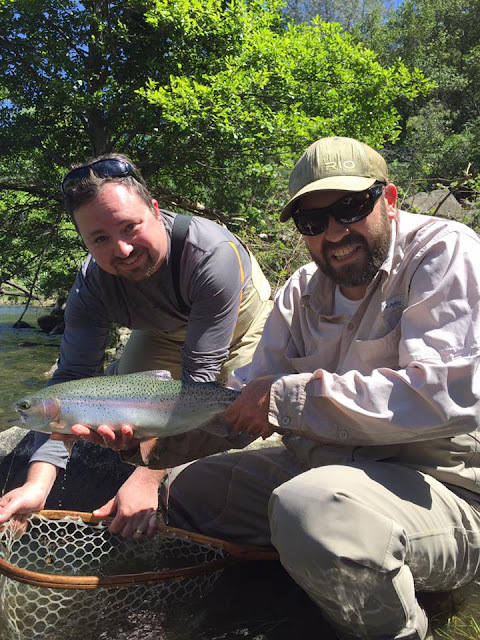 Fishing on the McCloud has been good where you can find soft water out of the torrent. Once anglers find this type of water they have been rewarded. The Road to Ah-Di-Nah is open following a washout this spring so this should provide more fishable water. Micro Mays, Psudo Nymphs, Birds Nests, Red Copper Johns, Missing Links, Elk Hair Caddis, Stimmys and Parachute Adams are all confirmed flies this week. As water levels drop fishing should improve. Truckee River – Good Flows – 1,800 cfs in town, 2,800 cfs at Boca. Water Temps. – Low 50’s. Clarity – some color. Fishing on the Truckee has slowed a bit with increasing snow melt due to warmer temps. Our guides have been catching some nice sized fish however. They’re still here, you just have to work a bit harder. There is definitely more water than we normally see this time of year but the additional water hasn't put the fish down entirely. It has been all about quality not quantity this season so far. There are still some BWO but the pmd's hatches right now so these are good bugs to have in your setup. Streamer fishing is also not a bad idea tight now. Stop by the shop or call in for the complete list of Truckee flies. Guide Tip "Those who are committing to streamer fishing are being rewarded." 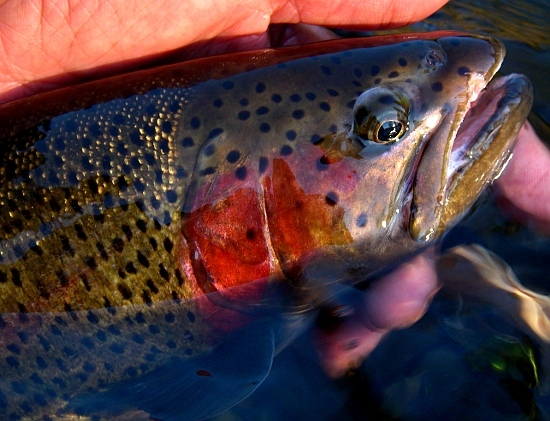 The Little Truckee continues to fish well despite the fact that it is flowing at over 900 cfs. These aren't the normal flows and fish are up in the willows, tucked in deep buckets and in slow side seams. They're still here you just have to adjust where you fish and get the depth right and you may have to go small when it comes to flies. BWO's midges, eggs and San Juan worms have been working lately. There has been a mid day blue wing olive hatch which has gotten things going. Czech nymphing and indicator nymphing both worked last week as did streamer fishing, but you have to work hard to get them on the big uglies. Two words... BLOWN OUT! But it's just a waiting game now. 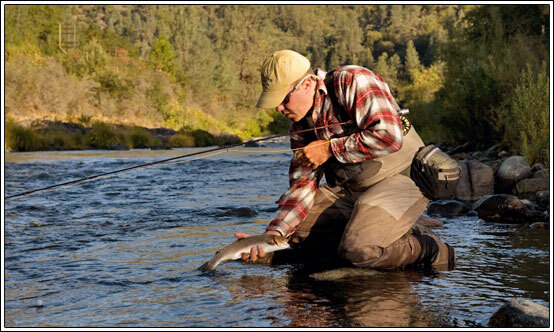 This is going to be a good Summer and Fall of fishing in the Yosemite area but it is still a bit early. We hope to be at it soon. Check back for updates or call current info. There are some opportunities 2 hours away from Twain Harte, call us if you would like to come out to the Yosemite high country. Tuolumne - 13,500 @ Merals Pool. 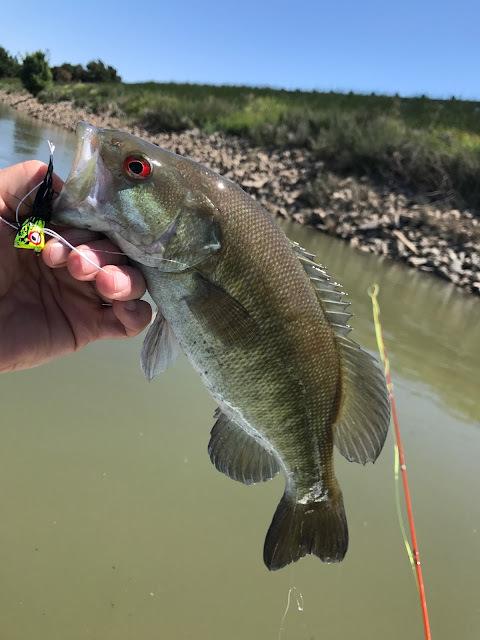 Some Tribs are fish-able South Fork is off color.Lower T below La Grange 7,400 CFS - Stay out of the current- VERY High flows, hard to access both banks. Merced- CLOSED by Park Service - 7,500 below Briceburg- Some tributaries are open3,000 below Crocker Huffman- still too high to drift. The Yuba is still very high but has supposedly dropped to 4,000 cfs. We plan to get out again and try this week. This river has totally changed with the high flows. The last time the Yuba blew out like this it took months to come back and didn’t quite fish the same for a couple seasons. We are optimists by nature as fly fishers so we are hoping for the best and not getting to fish the Yuba for a while is a willing trade for excess water and what it means for the state as a whole. The river has changed drastically so we will have to wait and get reacquainted with this beloved fishery once she comes back to us. If you simply must go try nymphing with PMDs BWO's and San Juan Worms should produce best.